Mystery Plays evolved from the ‘trope plays’ of the tenth century when clerks and monks began to enact short pieces of the scriptures in order to make them more understandable to their mainly illiterate congregations. Until the reformation, church walls were adorned with colourful paintings of biblical scenes and trope plays were little more than living pictures to accompany the Latin services. By the fifteenth century these plays had fallen into the hands of the laity and were performed on ‘Holy Days’ as part of the celebrations. The addition of the spoken word, in the vernacular, was a great step towards fulfilling the need in the medieval world to come to a deeper and more meaningful understanding of the biblical world. More importantly the Mystery Plays made reference to the lives of the performers and their audience. The enactments had an engaging and immediate reality that placed Christianity firmly in their world and therefore relevant to it, not just a distant mythology from an ancient and foreign land. The Mystery cycles that we know in Britain from the towns most associated with them, York, Coventry, Towneley (Wakefield) and N-Town (often associated with Lincoln), were also being performed in French and Italian towns during the same period. The plays were usually staged on wheeled pageant carts drawn through the city streets. Each play in the cycle became the responsibility of a particular tradesmen’s guild. The term ‘Mystery’ comes from the association with the Guilds and the ‘Mysteries of the Craft’ which were passed to apprentices. During the reformation, Mystery plays ceased to be crowd pleasers. The rising popularity of Morality plays – with less emphasis on the scriptures and more on a general debate of good and evil – led to the withdrawal of the support of the church. In 1542, the Bishop of London prohibited religious plays in his diocese and this kind of sanction and changing tastes led the Mystery plays to fall into disuse until their more recent ‘rediscovery’ by nineteenth century scholars and, since the 1960s, revivals by playwrights and theatre groups. Here in Lincoln, Keith Ramsay’s translation of the N-Town Cycle has been adopted as the City’s own and has been performed here regularly, under his direction, from 1978 to 2000. This new production draws on this rich heritage. You will see references to the historical background to these plays as well as new images and interpretations. In the middle ages, it was accepted that the Old and New Testament stories were linked. This ‘typology’ saw Mary redressing the sin of Eve (‘The Expulsion’ is often featured in the background of gothic paintings of ‘The Annunciation’); Christ’s death saving the souls banished to hell after Cain’s fall; God cleansing and renewing His world by flood and by sacrifice of His Son. In 2004 it is easy to see the resurrection purely in terms of belief or faith and not as a universally accepted truth. In the medieval world, plague, crippling disease, famine and torturous injustice were daily encounters and Christ’s conquest of death was a truly spectacular climax to the performances. Though it can be argued that perhaps little has changed, theatrically, it no longer seems enough. I hope that through this juxtaposition of old and new, image and word, ancient and modern, you will see this performance as relevant to you in your world and consider or re-consider the role and relevance of these stories in your lives today. Canon Andrew Stokes reminds us that God’s work is a ‘messy, argumentative business’ and that we may have to get our hands dirty. Our lives are often messy. God’s work can seem frustrating and confusing. Change is like a birth, bloody and usually accompanied by much groaning. I hope that you will think and talk about it all. JESUS ARRESTED BY A SWAT TEAM! 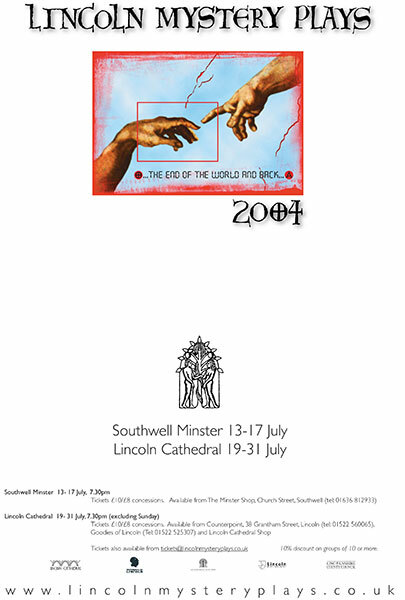 Tradition made way for innovation as the firmly post millennium production- complete with everything from Jesus being arrested by a SAWT team to Satan as an electric guitar-weilding rock star- unfolded in a blur of swirling lights and stage fog. Many of the plays were performed on trailers dragged into and out of the audience’s view, mirroring the way in which these drama would once have been paraded through the streets, and there were splendid sets, tableaux- especially the grim figure of Death flanked by a body hanging from a gibbet- and costumes throughout. But there were drawbacks too. Presumably, in an attempt to combat the minster’s notorious acoustics, the entire show- dialogue and all- had been pre-recorded and much of the time the players mimed or simply acted to their own lines. Unfortuneatley this meant it was sometimes difficult to see who was speaking, and also removed the dramatic impetus from many of the performances. The anachronisms were also difficult to reslove. Some worked surprisingly well- rock is the Devil’s music after all- but others, including Christ’s crucifixion by guerillas in modern combat gear didn’t. This was clearly intended to make scenes more ‘rlevant’ yet actually had the opposite effect, bringing a distracting sense of ‘unreality’ and removing the awe and majesty from one of the most dramatic and significant moments in mankind’s entire history. In the end this was a brave attempt to “do something different” with the Mystery Plays and while no drama is immune to change, this one proved to be more resistant than most.